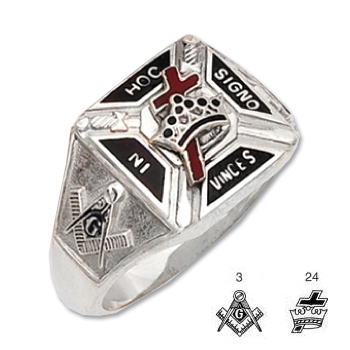 Solid back, polished sterling silver ring with high relief Knights Templar logo. Anti-tarnish sterlite. Black enamel side emblems and accents. G, compass & Square and Cross & Crown emblems are on this ring. To bad this ring is over priced by 60%. If it was priced between 130-150 dollars, this company would sell hundreds. Bummer!